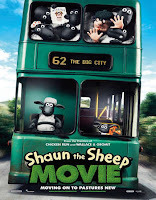 Shaun the Sheep Movie 2015 | FunToMovies 300 Movies '+g+"
Story: Shaun the sheep is tired of doing the same work at the farm everyday. He decides to take a day off. In order to do that, he needs to make sure the farmer doesn’t know. When more happens than they can handle, the sheep find their way in the big city. Now they need to get back to the farm.